On Tuesday we shared some thoughts about reimagining PIRATE Summit and announced that we will be moving it from September to July — July 3–5, 2018 to be precise. In this post we’ll share more about the planned changes. The first PIRATE Summit was unique and special in many ways. We had never organized events before and some of the basics like catering or registration were terrible. One thing that we did well — so we believe — was to get the right people together and set a context for them to meet in an authentic, intimate and non-transactional way. Over the years, as the group of participants got more diverse — that special atmosphere got kind of diluted. Of the above, meaningful exchange and connections is probably the hardest one to get right. For us it means providing a platform that allows you to connect with truly like-minded people, get fresh ideas, build long-lasting professional & personal relationships as well as receive honest feedback from people who’ve been riding the same rollercoaster for years. Most events struggle with it, especially once they scale. Many people we spoke to, find it extremely hard to connect in a meaningful way at big events and if they go, they prefer the satellite events. Our mission for the next years is to make PIRATE Summit the best event for meaningful exchange and connections in the startup community. There are only a few conferences that get content right. How often did you attend a session just to relax, work or simply play with the smartphone? We have seen this at our events as well. At PIRATE Summit, content was often just a byproduct. And that was fine as participants came to network. But we understand that we’re not a 250 people conference anymore and quite a few pirates join because they’re also interested to learn and get inspired. The small, interactive and well-moderated sessions were often rated the best in the past. Clearly we want to do more of those. If you’re interested in discussing your current challenges/ideas in a setting like this, PIRATE Summit will be for you. PIRATE Summit in its core was not built for investors but for founders and their needs. For those that decide to not take the bootstrapping route (which we heavily celebrate as well! ), one of the recurring needs is the need for capital. And when you select hundreds of hungry founders and gather them in one place for a couple of days, a lot of investors will follow. And we’re happy that we have a fund retention rate of almost 100%. We’ll give our very best that investors meet the right founders and vice versa, hopefully resulting in many great deals. In 2018, PIRATE Summit will spread across 3 days — or more importantly, 2 evenings. Evenings provide a great setting to create meaningful connections especially during a warm summer night, with cool drinks and an ARRR atmosphere. PIRATE Summit will kick off on the evening of July 3rd. 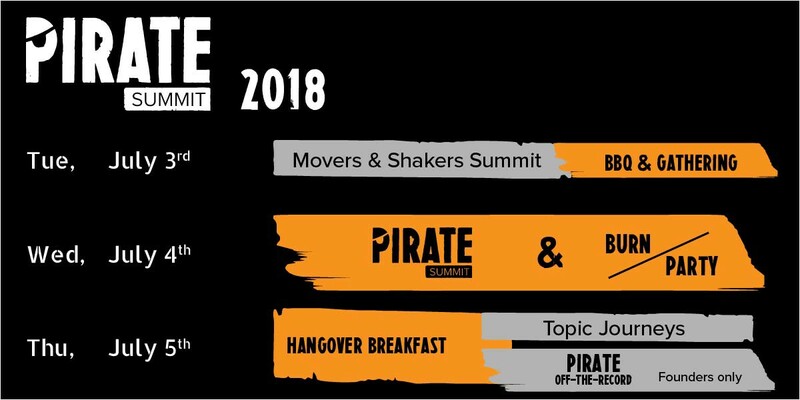 Rough schedule of PIRATE Summit 2018 (in orange) and side events. The selection process is one of the key elements at PIRATE Summit (it’s invitation/application only, in case you have never been). In fact, we will even sharpen our selection criteria (the criteria will be published once the application form will go live). As a result we probably will reject more applications than we have in the past. If that means that we end up with less participants than in prior years, then so be it. Our objective is to bring the right people together in a unique setting, not the maximum amount of people. We value a personal & small setting and hope you do, too. As written above, one of our main focuses is to connect people. In the past most of our participants also came to do just that. And granted, the unique PIRATE Summit atmosphere and the size of the venue makes it easy for everyone to be more open and approachable. As mentioned before, PIRATE Summit’s appeal was never strongly connected with its content. The agenda is an important, yet not the central piece of why people should join our event. And while this will stay the same, we are still aiming to change many aspects of how and what content the PIRATE Summit program will include. The Walk-The-Plank pitch competition will remain at the heart of PIRATE Summit. However, we are currently discussing how to make it more engaging, interactive and fun. We’ll open registrations and announce the (new) approach and rules in February. PIRATE Summit will run from July 3rd to July 5th. While the second day is purely PIRATE Summit, on the first and third we will organize events tailored to a selected crowd of people. There will be no speaker’s dinner. Instead we are introducing a huge PIRATE gathering with BBQ, drinks and plenty of opportunities to connect for all participants on the first evening. It will also be the official opening of PIRATE Summit 2018. The first Startup Ecosystem Summit in 2017 was a success. 50 movers and shakers from 35 countries came to discuss learnings and challenges in building startup communities. This year we’ll organize it again as the Movers & Shakers Summit on day one (July 3rd). After the hangover breakfast (trust us, you’ll need it) on day three, we’ll organize several topic journeys in Cologne. The topics aren’t fixed yet, but expect things like AI, Blockchain etc. The idea is to connect, learn and work in small groups of like-minded people. Also on day 3 we are introducing a new format, which we call PIRATE Off-The-Record. This event is strictly for selected startup founders only (no exceptions). We can keep this short. We love to organize some crazy stuff — think of the burn, the party and our bungee jump tower or zipline of course. And yes, we might even bring more of it. Also we’ll think about how to integrate more tangible innovations and products as well as how to integrate more creatives and artists into the Summit. Nothing changing here — we’ll stay in our beloved Odonien. You can expect at least the same vibe and the same atmosphere as in the past years. And no, we won’t be adding any VIP, press or speaker lounges. Everybody is a VIP (rule 2 of our house rules, remember). We will be communicating our ideas & share bits and pieces of organizing PIRATE Summit 2018 with you here via blog posts and we appreciate your feedback.